1 salle de douche avec W / C à l'étage supérieur. 1 salle de douche avec W / C sur le rez de chaussée. Notes sur l'hébergement: Chambres à coucher et des espaces de vie sont climatisées. Dehors: Grand jardin clos de 10. 000qms, la moitié de la forêt privée. Grande terrasse avec table et chaises, chaises longues et parasols. Piscine privée avec une intimité totale. Buanderie: Buanderie avec machine à laver, fer et planche à repasser. Service de nettoyage / serviettes / / Femme de ménage: Draps et serviettes fournis. (Serviettes de plage) Non Maid service deux fois par semaine. Lovely villa - amazing views. Villa Daisy is great for both indoor and outdoor living - a beautiful pool and a large terrace with long table and chairs for eating outside, as well as a similar sized one inside in a spacious open-plan living area. The owners (Ilias and Daisy) and caretakers (Lika and Haris) were very accommodating and quick to help - from letting us into the house early on the first day, to coming out as soon as we phoned when we realized the fridge/freezer wasn't working properly. Within a few hours we had a brand new one! There was a generous welcome pack in the kitchen and the house was spotless. It is located up the hill from the village of Fiscardo, so we could walk down to Emblisi beach or into the town. Yes - a bit steep walking back up, but still do-able and good exercise! There is a lovely bakery only 50 yds or so from the property, for breakfast bread and other goodies, and also a restaurant with amazing views out over the sea - we ate there a few times and enjoyed everything. We also loved sitting on the first floor balcony with our pre-dinner drinks, watching the sunlight fade from view on the cliffs of Ithaca. We were happy to spend a couple of days just relaxing at the villa whilst we got used to the heat, but also spent time wandering round Fiscardo - a very pretty little place - and hired a car for 2 days to visit Assos and Agia Efimia. And if you like boats - a day trip to Ithaca is a must, stopping for swimming in the crystal clear sea. A special thank you too to Haris, who came to our rescue when we stupidly left the house keys in the inside of the front door on our last day there, so were locked out. We just had to say 'Help' and he was at the house within minutes! All in all, a wonderful villa and holiday location and I hope we will be going back! Villa Daisy is a great place to stay. We were a family of 5 adults and had a wonderful holiday. The arrangements for arrival worked smoothly. The owners, Ilias & Daisy, could not have been more welcoming and hospitable. They came to see us on our 1st day there & on the day before departure. Although we didn't need anything during our time there, they struck us as kind & gentle people who would offer any help should the need arise. The villa is clean and very well proportioned. The swimming pool, deck & furniture are of a high standard & provided many hours of fun, relaxation & cooling relief from the hot sun. The air conditioning in the bedrooms worked a treat & permitted nights of relaxing sleep. The beds were very comfortable. The villa is very well equipped, lacking nothing that is needed. The washrooms and shower cubicles are very small. The bathroom & kitchen furniture & fixings are basic, but serviceable. The location of the villa is very good. Views from the ground floor are obscured by trees, but views of Fiscardo harbour & surrounding coastline from the roof are breathtaking. Access to the roof is via a metal staircase from the first floor. Fiscardo is just 15 minutes walk away, as is Emplisi beach. There are many tavernas, shops, cafes, restaurants within walking distance. We did the snorkelling boat trip by Ioanian Disciveries - got to see much marine life, swim with Loggerhead Turtles & were not disappointed. We also visited beautiful Asos - the climb to the castle is worth the effort. Mirtos beach is worth visiting, but we preferred the smaller beaches of Emplisi & Kimilia. A day in Argostoli is worthwhile, but bear in mind that everythihg closes between 2pm & 4pm. We'd definitely recommend Villa Daisy & Fiscardo. This was our 2nd visit to Kefalonia & will certainly not be our last. Probably our best family holiday ever! The villa was absolutely perfect for our family of five. Fiscardo is walking distance as is Emplisi beach which was great as we really didn't want to spend too much time in the car. Our favourite beach was Kimilia which is 5 minutes drive and then a walk through the trees to the magical bay. The villa is well laid out for a family, and although basic, it was all we wanted. Lika and Haris made sure that the the villa was cleaned twice during our 10 day stay and were extremely helpful with key handing over etc. The swimming pool was a perfect size and we had lots of family barbecues using the barbecue provided. We would love to book it again for next year! We have stayed in this villa twice now and are booking for next year. I think that says it all! 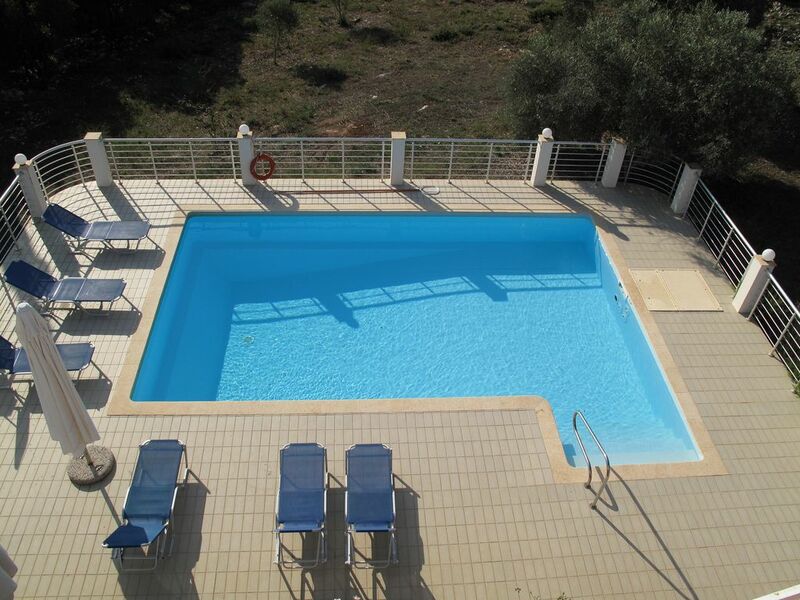 Lovely spacious villa with fantastic pool area and gardens. Very private but only five minutes drive into Fiskardo, but you could walk. Everything you need is provided. Ilias and Daisy are a lovely couple and very helpful. Booking is very easy with good communication. I would highly recommend this villa. Marcher - au cours de la dernière année, anciens sentiers ont été ré-ouvert par la société culturelle et environnementale de Asteris. Ces sentiers vous mènera à travers les vieux villages, le long des terrasses de pierres sèches et sous forêts de Cypress avant de retourner à leur point de départ. Ils sont bien indiquée et une merveilleuse façon de découvrir la région. Plongée sous-marine, voile, location de bateaux et de l'équitation. Location de bateaux peut être pré-réservé et nous offrons aux clients un rabais. De Patras par ferry à Sami (35kms à Fiskardo). De Lefkas Fiscardo par ferry. Location de voiture est recommandée, pour explorer la merveilleuse île. Les taxis peuvent être organisées pour les transferts depuis et vers l'aéroport. 500m de la plage et à 800m du port de Fiskardo avec ses bars, restaurants et magasins. Booking Notes: A non-refundable 30 % deposit is required at the time of booking. Changeover Day: Our changeover day is Saturday. However, we try to be as flexible as possible. Notes on prices: The prices are in Euro, for the villa, per week. Payments to the bank of the owner.